For the first time, the beer brand will use Instagram's Stories (and golden cans!) to more closely engage with the audience. Yesterday, Kansas resident Lyle Randa woke up to a dream—he had become the sole winner of Super Bowl tickets for life thanks to a gold Bud Light can. Launched in November, the Willy Wonka-type contest was part of the beer brand’s social campaign leading up to this year’s Super Bowl. In every case of Bud Light beers, consumers had a chance to find a gold-colored can. By posting a photo of it to social media, they were entered to win two tickets to the Super Bowl for the rest of their life. The social effort, like the brand’s TV commercial airing on the game, centers on a new theme for this year’s Super Bowl, "Famous Among Friends." The brand is planning to do more on social media and mobile this year to bring that theme to life. "One of the best parts about leaning into friendships is the natural connection to social media," said Victoria Vaynberg, senior director of digital marketing at Bud Light’s parent company Anheuser-Busch, in an email, "Social media is where you share the moments we’re celebrating." Bud Light worked with its AOR Wieden+Kennedy and social agency Laundry Service to create shareable content that would highlight the moments between friends when Bud Light represents more than just beer. That means running video ads and GIFs on Facebook, Instagram, Twitter and YouTube that capture friendship moments, like making a best-man speech, dodging paintballs and helping your pal move. Most of the social content is repurposed from the campaign's first spot which aired during the NFC Championship weekend, which has generated 458,292 views on YouTube since its release last week. 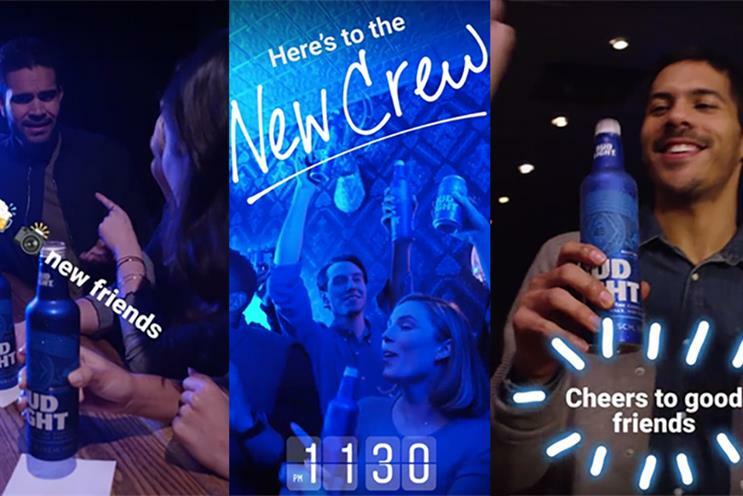 This marks Bud Light’s first time using Instagram Stories, the Snapchat-like feature that allows users to share photo and video "stories" that disappear in 24 hours. Stories, which debuted in August, now boasts 150 million active daily users. In January, the platform introduced ads into Stories. Up until February 7, Bud Light is running a 15-second ad within Stories that follows a group of friends during their night out. Vaynberg said Instagram’s Stories feature is an accessible way to showcase friendship moments from a first-person point of view. "We've been big believers in Instagram for years and look at it as a vital platform to reach our consumers on mobile," said Vaynberg in an email. "The trajectory of Stories over the past six months has been very impressive and we're excited to leverage this new creative canvas for ‘Famous Among Friends’ in 2017." Bud Light will also tap into Facebook, Instagram and Twitter ads with four 20-second GIFs and a 60-second video optimized for mobile. The GIFs are strategically the same for all platforms, according to Vaynberg. "We felt having the consistency across both platforms was important," she said, "especially at the outset of the campaign. We may change the strategy later this year, but so far we are pleased with the results." On Super Bowl Sunday, Vaynberg said there will be a "healthy amount of social content" from the brand, but she said it’s too soon to say whether there will be any live activations once the kickoff happens, a path that advertisers like Hyundai and Snickers are taking this year. The friend-centric theme is a departure for Bud Light’s approach to the Super Bowl, which last year centered on TV spots in which Amy Schumer and Seth Rogen gave mock campaign speeches. In October, Bud Light chose to end "The Bud Light Party" a few weeks early after declining sales. But Vaynberg said the campaign wasn’t entirely disappointing. "’The Bud Light Party,’ while it did not increase sales, did help drive positive brand health evolution, especially among millennials and Hispanics," said Vaynberg. Vaynberg said it will take time to turn around a brand the size of Bud Light, which, she said accounts for one-fifth of the total category. "With everything we do from a marketing standpoint, including what we do from a social media standpoint, is to continue to tap into consumer culture," wrote Vaynberg, "so we’ve worked hard to find what is most true for our beer. What we’ve found is the moments, both big and small, spent with friends while drinking Bud Lights are worth celebrating, because you aren’t just drinking beers, you’re building friendships." How should programmatic change our approach to the Super Bowl? Why are beer brands still ignoring women?